The Boggasse, formerly called Bockgasse was mentioned by name in the 16th century for the first time.. The origin of the street name is no solid evidence and has given in the Romantic period to the wildest speculations occasion; may the name of Bog would derive from pangan God “Bog”. 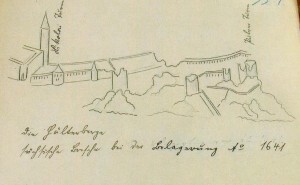 But it is certain that in the years 1553 – a Bastian Bogk first documented in the so-called “bullet books” (now referred to as tenant lists) in 1559 the suburb, the (now Lunitz) began with the houses on the eastern edge of Lunitzgasse, recorded and obviously prevail was for the establishment of the street name. These evidence-itself became superfluous all previous recordings of the street name. 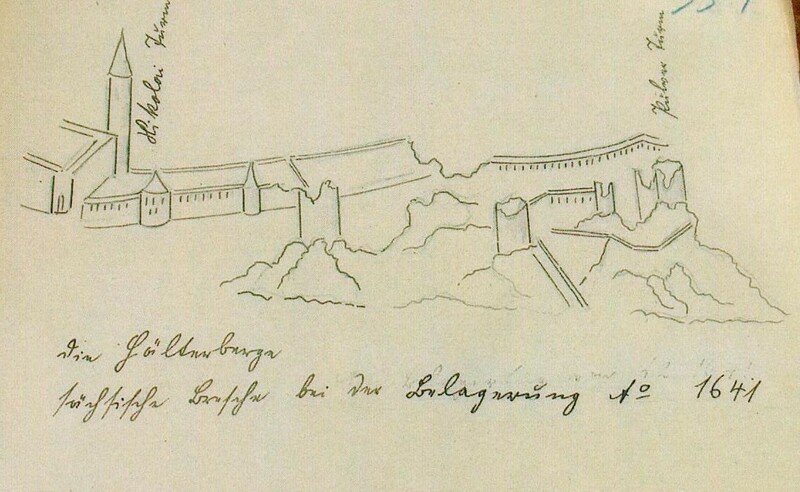 The course of the former Boggasse was such that it was continued in the north of a small Gässlein called dead alleys, during Steinweg west abbog from Boggasse. 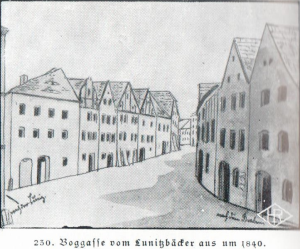 The great fire in 1642 were about 100 houses in the Nikolaiviertel victim of a large part of western Boggasse. About the reconstruction of houses, there are no reliable findings. But it is certain that in 1717 fell victim to the homes of Boggasse the greatest conflagration in the region. 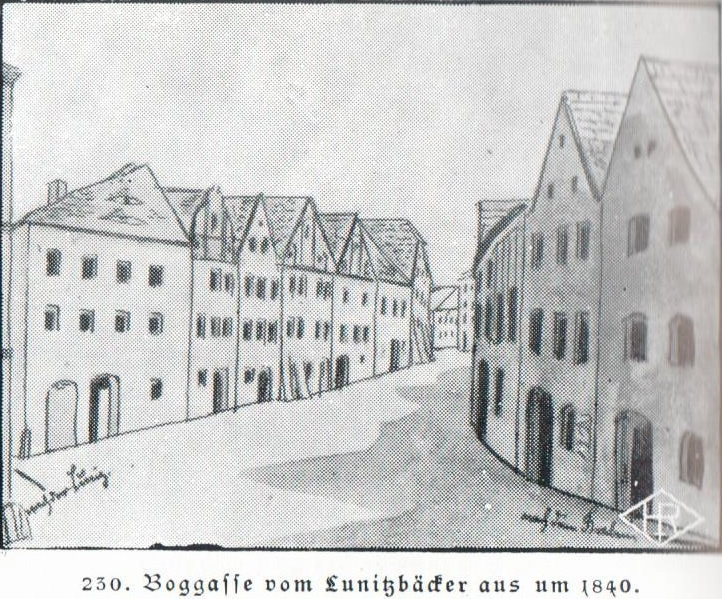 In 1770 Knauthe describes history and face the Bockgasse (Bogkgasse / Boggasse) after the fire of 1717 as follows: “The Bockgasse goes straight from the Nikolai gates to the Nikolai Church, this included on the south side 8 houses, and on the north side of 12 homes.” It is also known that the Boggasse 1799 first paved. It is significant that the Boggasse was an integral part of the transport route for trade carts, which, coming from the north, west veered into the big Wall Street, and then to drive through the Boggasse the Nikolaitor. The appearance of the row of houses on the Boggasse who later Bogstraße could the changing times and of taste escape any more than other parts of the city. the road is dominated today by a juxtaposition of old, mostly small houses next to houses with modernized display sides and houses with “vain” Renaissance imitations. The “inner life” of most of the houses allows conclusions to a two hundred year history. The house Bogstraße 2 presents example, typical for this time space-saving staircase in the form of a bent spiral staircase to the compelled the narrowness of the street facade. Another indication of the unique assignment of the house to its origin is the vaulted passage that accompanies the visitor from the staircase of the house to the backyard of the building and its western outer wall has an extraordinary strength, which the presumption allows that there may been static reasons, the damaged by fire in 1717 building to strengthen in this area. The house Bogstraße 2 has another special feature on the street side located on the 1st floor painted wooden beamed ceiling, which can be dated in the first half of the 18th century.. The ceiling of the two adjacent rooms on the street side on the 1st floor which can be a presumption that it may have once been a total space with room character. On the north wall of the building is also on the 1st floor niches in masonry visible, their stock is probably to be dated around 1500, so we are dealing with one of the earliest building on the Boggasse. From ancient archive documents, a remodeling of the entrance area of ​​Bogstraße with the installation of a retail store shows that during the 19th century. Took place. For historical address books of the city of Görlitz, conclusions can be drawn that the store was operated in the years 1897-98 by the master butcher William Hanke, who was also the owner of Bogstraße. 2 Traditionally this deliverable was continued in this house until the present. Another entry to took place in 1949-50 with his wife Käthe Wenzel, who worked as a cashier in the butcher’s shop and also lived in the house. We know that the subsequent owner Mr Alfons Süßmuth the object acquired with the intention to open a butcher shop, but this was forbidden him. The shop belongs to Meat and Fleischbeschauung was incidentally in the building Lunitz 21a. This house breathes history !!! We recommend interested audience the book “History of Görlitz” of Richard Jecht.